Obituary for Katherine Truba | Grays Funeral Chapel LTD. 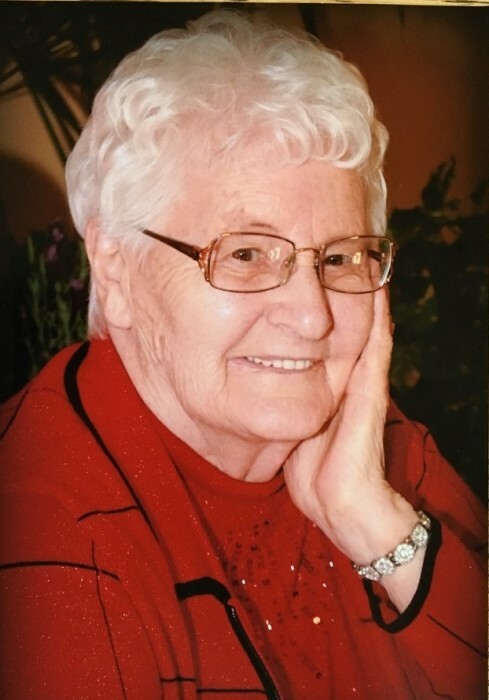 Mom passed away peacefully on Wednesday, March 20th, 2019 at the Victoria Union Hospital in Prince Albert. Katherine Truba was a well-loved wife, mother, grandmother, great-grandmother, and friend to many. She was born on the family farm in Strong Pine on July 21st, 1928. There she attended the community school where she enjoyed and was proficient at many sports including baseball and soccer and took pleasure in being better than most of the boys of her day. She spent her childhood surrounded by friends, cousins and her siblings later recounting with pride the bond she shared with her brothers and sisters and how even as children they never had petty arguments or rivalries. This bore fruit in the many joyous and boisterous family gatherings that would follow in later years. In 1945 Katherine married George Truba and moved to the Meath Park area, where she was a hard-working farm wife who worked side by side with the men in the field as well as managing a garden which was just slightly smaller than the quarter section of land they farmed. From that garden and farmyard, she worked to fill freezers and shelves of preserves that provided for her family. After George’s passing in 1990, Katherine remained on the farm and took on the role of mentor and instructor to her grandchildren. Unknown to their parents the underage children were taught to drive to the end of the lane to meet the school bus when they were too “tired” to walk, a secret kept for a long time! In 1995 she began a new chapter of her life by moving to Northcote Manor in Prince Albert and for the first time ever, at the age of 67 she lived away from family. This was a time where her life shifted to a social focus with new friends to be made and the hard work was left in the past. The family would like to thank Debbie Salmond of A Daughter’s Hand and the wonderful caregivers at Kopera Homes & Good Shepherd Villa for their care and assistance in mom’s later years. Our thanks also to Dr. Adel Ben Saleh and the magnificent nursing staff of the 6th Floor, Victoria Union Hospital. Your professionalism, empathy, adaptability and caring natures did not go unnoticed. Thank you so much! Mom is loved and remembered by her daughters: Carol (Dale) Toni of Moose Jaw and Marilyn Gray (Menzies) of Saskatoon; her sons: Dennis (Glenda) Truba of Meath Park and Stephen (Linda) Truba of Rocanville;her grandchildren: Jason (Belinda) Toni, Gina (Tyler) Yates, Erin (Andrew) Boryski, Paul Menzies, Tom Menzies, Lori (Jeff) DaSilva, Darryl (Candace) Truba, Michelle (Jon) Kotylak; her great-grandchildren: Abigail & Madison Toni, Finnegan, Indiana & Grayson Yates, Wren & Birk DaSilva, London Kotylak; her sister Verna (Gus) Radis; her brother John Ferchuk; her sister in law Margaret Ferchuk. Mom was predeceased by her husband: George; her parents Alex and Mary Ferchuk; her brothers and sisters; Bill (Veronica) Ferchuk, Lee (Wes) Arnold, Nick (Roberta) Ferchuck, Sonja (Nick) Skakivitch, (Lawrence) Schell, Joe Ferchuk; son in law; Robin Menzies. A Memorial Service will be held Saturday, April 27th at 10:30 a.m. at St. George’s Ukrainian Catholic Church. In lieu of flowers, a donation to the 6th Floor, Victoria Union Hospital in Prince Albert would be gratefully accepted. Condolences may be sent to the family at www.grays.ca. Funeral arrangements have been entrusted to Gray's Funeral Chapel. There's still time to send flowers to the Memorial Service at the St. George's Ukrainian Catholic Church at 10:30 AM on April 27, 2019.